A displacement vessel in steel and alloy with a range of 4.500 miles, she can sail in all weathers without having to reduce cruising speed by even one knot. Plus all the class you could want, in an environment that miraculously succeeds in combining Italian style and oriental atmospheres. Half load displacement: 550 t.
Full load displacement: 580 t.
Full load draught at keel: 2.95 m.
Croce di Malta 100 A-1 SSC Yacht Mono G6 LMC, UMS MCA Compliant; RINA Charter Class. 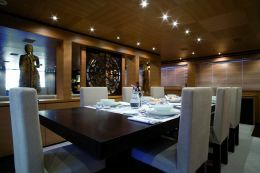 For further information: Cantieri Baglietto (Gruppo Camuzzi Nautica), Viale S. Bartolomeo 414, 19138 La Spezia. Tel. +39 0187 59831; fax +39 0187 564765. Website www.baglietto.com. Email: laspezia@baglietto.com; baglietto@baglietto.com. Of the most evocative Made in Italy names worldwide, Baglietto is certainly one of the oldest and best loved. Also because it is far less imitated - it is virtually inimitable - than many other flagships of national elegance. A sort of natural copyright protection due above all to a know-how which this Ligurian yard distributes throughout every vessel it builds and which cannot be improvised even with the most stubborn of wills. And then a determining role is certainly played, in the uniqueness of each piece, by that magical coupling of master craftsmen and the artistic experience that characterises the few designers who've had the honour and the onus of presenting a design to be created. This time it was architect Francesco Paszkowski's turn to put his name to a floating dream. 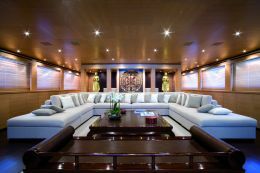 Considered an actual star of the new wave in international yachting, he's a designer with such an overall and at the same time thoroughgoing vision that he can set the style of a 53 metre hull and simultaneously give form to the furnishings and accessories that will embellish the interiors. Perfectly in line with a trend that is catching on from year to year all over the world, the yacht in question has a displacement hull in steel with light alloy superstructures: a long-lasting vessel, timeless, with a regular pace and great range. If we compared it with a car it would be a Camel Trophy 4WD and certainly not a Formula One racer. 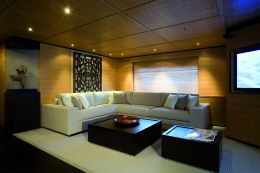 We like the idea of noting a philosophical coherency between this mature and wise approach to the ship, inasmuch as it is a means of transport, and the owner's request for unequivocally oriental style interiors, inasmuch as it is a vital space. 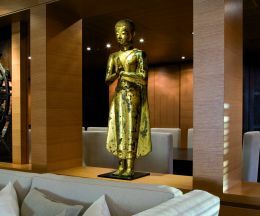 In fact, moving around aboard you breathe the same indefinable atmosphere of peace and serenity found at the Bangkok house of Jim Thompson, the mysterious silk king. The villa he built in the centre of the Thai capital in the late 1950's has become an actual city monument. The same colours, the same contrasts. Even the same perfumes. 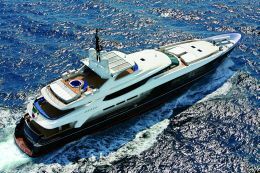 The yacht was launched at the yard's La Spezia premises which since 1999 have flanked the historic headquarters in Varazze. In fact it's in this "new" structure with telescopic sheds - formerly owned by the Ferrari shipyards - that Baglietto can build its biggest vessels. The definition displacement is purely technical, hydrodynamic, and therefore chiefly regards what is concealed beneath the waterline. 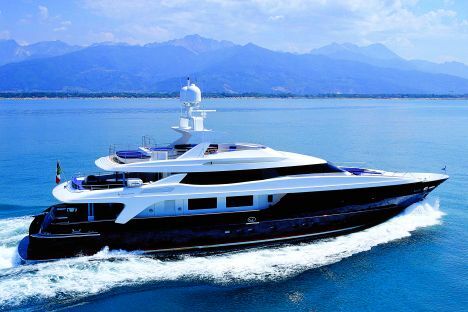 The Blue Scorpion 53M (reference to length serves to distinguish her from the 42 metre of the same name launched in 2003, also at La Spezia) actually hides her true identity behind a decidedly more dynamic appearance. To such an extent that seeing her under way at 15 knots she looks more like a powerful planing hull manoeuvring than a displacement vessel at cruising speed. In fact with the thrust of two reliable 2.637 HP Caterpillar 3516Bs Blue Scorpion can easily reach a highly respectable 17 knots, but at the cost of a loss of range, the latter being another of her main strong points: there aren't many yachts that can cover no less than 4.500 miles non-stop, at economical cruising speed of 12 knots. Description of the interiors is made quite simple by the clear functional separation of the four decks that make up the vertical development of the design. 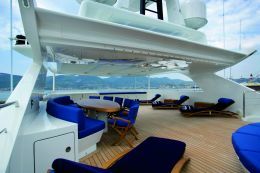 The main deck has a vast outdoor area aft, furnished with sofas, armchairs and a coffee table: a sort of antechamber to what you glimpse through the large glass sliding door which leads to the great saloon. This spacious area, with its warm and rigorous oriental essentiality, is separated from the dining area (a rectangular table seating 12) by a screen which bears, among other things, a very special antique: a splendid rosette of clearly mystical inspiration. The woods selected are moderately severe: wenge for the floors - partially covered by coconut matting - and dark oak for the furniture. Forward, in a privileged position for privacy and silence, the owner's suite consists of a bed area and an elegant study. 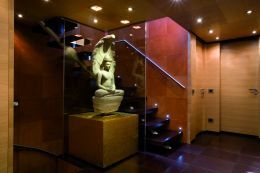 The private bathroom is rendered bright by balanced matching of light coloured marbles, steel and glass and is equipped with double washbasin, oval Jacuzzi and a large shower unit. 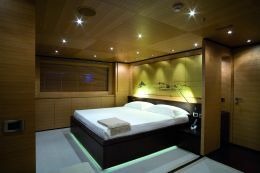 The guests' night area is on the lower deck where the style is minimalist, playing on contrasts between light and dark elements: there are two spacious VIP cabins with king size bed and private bathroom, and two cabins with twin beds, private bathroom and shower unit. Forward, in a fully separated area with independent access from the upper deck, there are six crew cabins with bathrooms and dinette. The service area aft, also separated from the guest zone, consists of a laundry with four professional-type machines, eight refrigerated cells, the technical cabin for plant management and, notably, the large engine room. Even more technological - if possible - is the bridge which occupies part of the upper deck and is directly connected with the captain's quarters. On the same deck there's a well equipped gym and a lounge furnished with small, comfortable armchairs from the Antalya McGuire collection and a period Chinese opium bed used as a sofa. 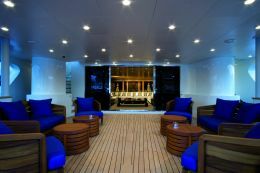 Close to the external veranda this space is ideal for enjoying more direct contact with the sea while under way. For those who want more direct contact with the sun, there could be nothing better than the splendid flying bridge. 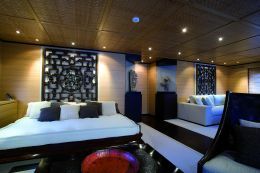 Here, set around a Jacuzzi, we find a pleasant oasis with a large semicircular sofa, six comfy sun-beds and an oval table. A series of mechanically moveable shades can be activated when the sun gets too aggressive. The very high class results on a pure liveability level, which can only be certificated by the good taste of the beholder, are matched by the fineness of the technical design and constructional quality which have gained the Blue Scorpion 53M an enviable collection of international certifications. Among these we should mention the Italian Shipping Register (RINA) Charter Class, assigned to the vessel during the last Monaco boat show.